For Essex, I had it in my head that around £8.00-£9.00 would be the perfect price, allowing value for money but high enough to ensure the quality. The first thing I realised was that unless you were prepared to spend upwards of £11.00 for a Sunday lunch, then there are not any decent websites for establishments in the Ockendon / Thurrock area (read that as “none”!). Eventually, I narrowed down to a couple of pubs, the deciding factor would be whether they offer children’s size meals and also the cost of the Sunday lunch. 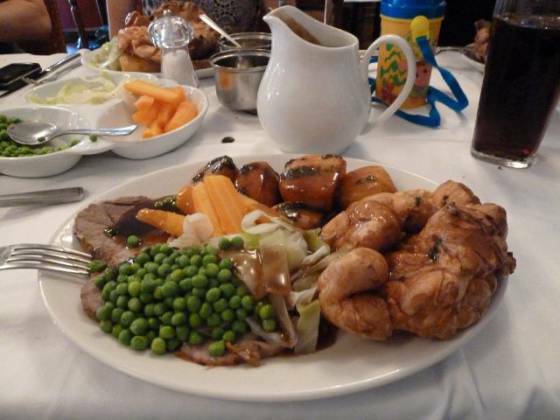 I called one pub; yes, they provided children’s Sunday lunch for £5.95, and an adult’s roast was £8.95. 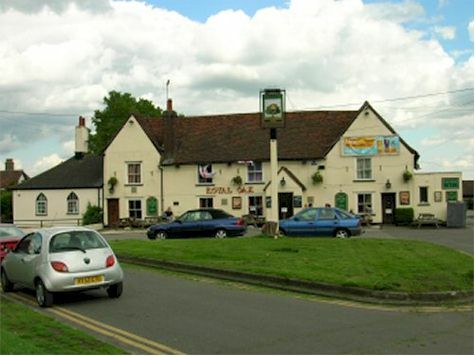 The Royal Oak in South Ockendon ticked both boxes, so I booked a table for 4 adults and 2 children for 1 o’clock. I had it in my head that this was going to be a country pub, so I was a bit surprised seeing it the edge of a small town. They have a car park behind, and you walk back round to the front of the pub. The outside impressions were mixed, they had a fish monger selling outside which was definitely a first for me! Inside, I have to say I was a bit worried initially. Walking through the doors, the pub seemed quite small, with a couple of tables, an arcade game of some kind and doors into the “garden” – a paved area, for smokers I imagine as it didn’t seem very habitual. I was relieved to find quite a large restaurant area around the other side of the bar. Claire and I walked round to the restaurant area, we were greeted straight away by the restaurant manager and shown to the table. This was right next to the toilets, but thankfully there was no smell eminating. For us, being close to the toilet was actually quite fortunate due to the fact that Gail’s hurt her foot and it would be less walking for her if needing to use the facilities. After they arrived, the restaurant manager came straight over to take the drink order, which arrived very promptly. We were then asked what we would like, roast chicken, lamb, beef or pork. Claire and Gail decided on the beef, Chris on the lamb. The two boys asked (well, Mummy asked) for a child’s roast turkey each. I overheard someone earlier asking for “dual meats”, so asked if this was possible. For an extra £2.50, I could have a mixture of meats. Now, regular readers should be aware by now I NEVER turn an invitation like this down :-) Within a minute of two of ordering, the restaurant manager brought out 4 pots of various accompaning sauces for the meats consisting of apple, mint, horseradish and cranberry. As normally we are asked if sauces are required, this was definitely a welcome touch. A couple of things about the pub decor, whilst we wait for the lunch to arrive. The pub itself was quite dark, although the restaurant area did have light painted walls and pictures of London in various guises. The forementioned toilets were a standard pub affair, clean but very basic (hand dryer in the ladies didn’t work and there were no paper towels). The chairs were not very comfortable, but the bench along the wall was ok. The table was covered with a linen table cloth, and seemed good quality. We had a cheap paper napkin and a knife and fork at each place on the table. Our food came out very quickly, less than 10 minutes from ordering. The boys’ plates came out first, with lots of turkey, three roast potatoes and a yorkshire. This was enough for an adults portion, so definitely good value for money. 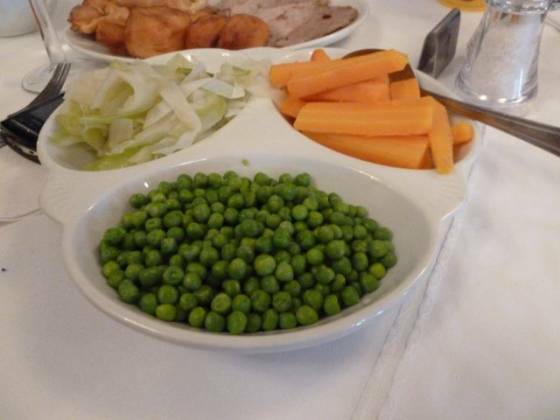 Then, a selection of vegetables came out, so Gail and Chris could get the boys’ plates ready. Claire’s and Gail’s roast beef out next, Chris’s lamb followed after. Then two large porcelin jugs of gravy… but, where’s mine?! Phew, mine came out about two minutes afterwards. The Royal Oak, South Ockendon – Mixed Roast Meat! 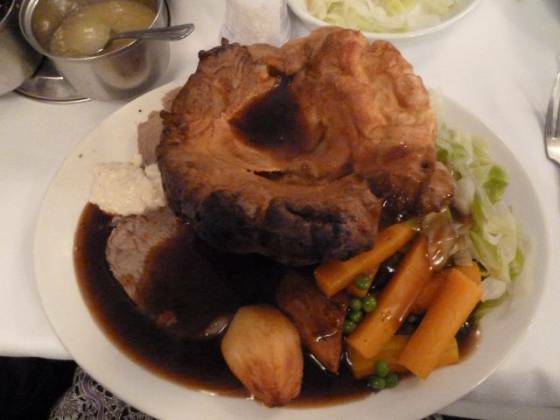 We were all happy with our choices, me especially… I had a slice of each meat, around 8 roast potatoes and a very large home-made yorkshire pudding. We all helped ourselves to the vegetables, which were peas, carrot battons and cabbage. Lastly, lashings of gravy. We all tucked in, I was very quiet for about 15 minutes! The quality of the food was excellent. The yorkshire pudding was very nice, whilst not fluffy it was definitely fresh. The meat was tender and plentiful – not a lot of seasoning but nice quality. The vegetables were also good. A point on the gravy, I had far too much on my plate. It was like a Sunday roast soup! Mind you, that’s not their fault, I decided to fill my yorkshire with it! 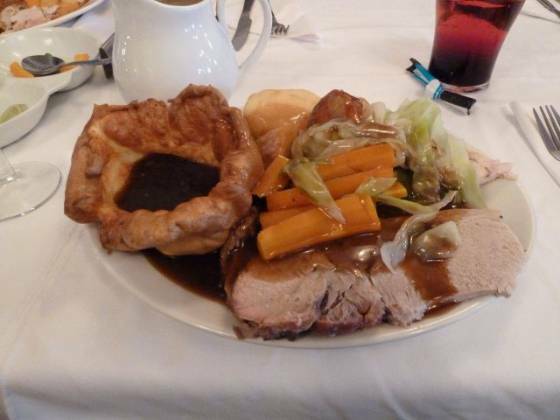 The gravy was also very good, nice and thick with plenty of flavour. I am sorry to say, we all left food on our plates (apart from Chris, that is). There was just so much there, I couldn’t fit any more in (unless I didn’t want dessert, which wasn’t going to happen!). The restaurant manager then asked whether we would like soem dessert or coffees. The Royal Oak do not seem to believe in menus, as she reeled off the dessert list much in the same way as the main courses. There wasn’t a lot of selection really, with ice cream, strawberries & cream, waffle & ice cream and lastly bread pudding. The grown-up children (Gail, Chris and myself) all went for waffles (it came with maple syrup! ), one of the boys asked for ice cream, the other and also Claire opting-out. The desserts came very staggered, with Gail and Chris’s out first. Mine came out a couple of minutes later. I had a lot less ice cream than Gail & Chris. Mind you, not as less as one of the twin’s, as his didn’t come out at all! This was extremely disappointing; as the desserts were coming out so staggered, we expected them to bring out his ice cream after a minute or two. Unfortunately not, thankfully he was placated with Gail promising a “rocket ice lolly” when they get home. 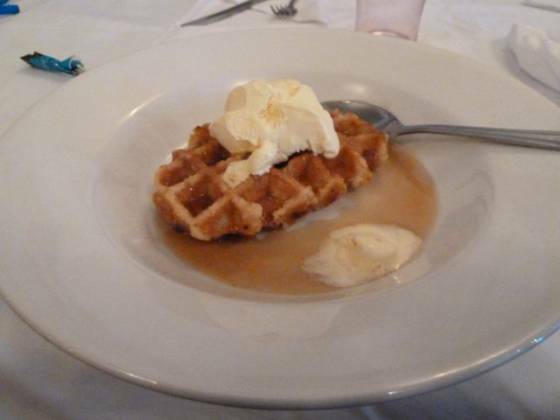 The waffle was quite nice, as was the ice cream and maple syrup. A standard affair really, but something I haven’t had in a long time so it was a bit of a treat. I would have preferred sticky toffee pudding, as this is one of my favourites – I can eat it in whatever weather, even if it’s a sorcher outside with the met office issuing warnings (which they were!). It took a while for the bill to come out, and it wasn’t itemised as they have a new till. As there were in essence two groups with one bill, we needed to know how much each owed so asked about the cost of dessert. The restaurant manager disappeared for a couple of minutes, came out and seated some more people, then back to us to say “£3.45”. Not a bad price for pudding. So, to wrap up. I dislike focussing on the negative, we are “reviewers” not “critics”. Being reviewers mean we must focus on the positives and accept that not everywhere is going to be perfect. Unfortunately, the service really let The Royal Oak down. It wasn’t as if they didn’t have enough staff, there were at least 4 people behind the bar when we came in. I think it was just down to disorganisation. I would like to give them the benefit of the doubt though and chalk it up to an off day. The food quality was excellent, being the great value for the quality and amount served, I was especially pleased that I could have a mixture of meats. We were also grateful they provided children’s portions as standard. Our scoring system places a lot of emphasis on the meal quality, whilst still taking into account the service and venue. Therefore, the Royal Oak receives 3.5 plates out of 5.